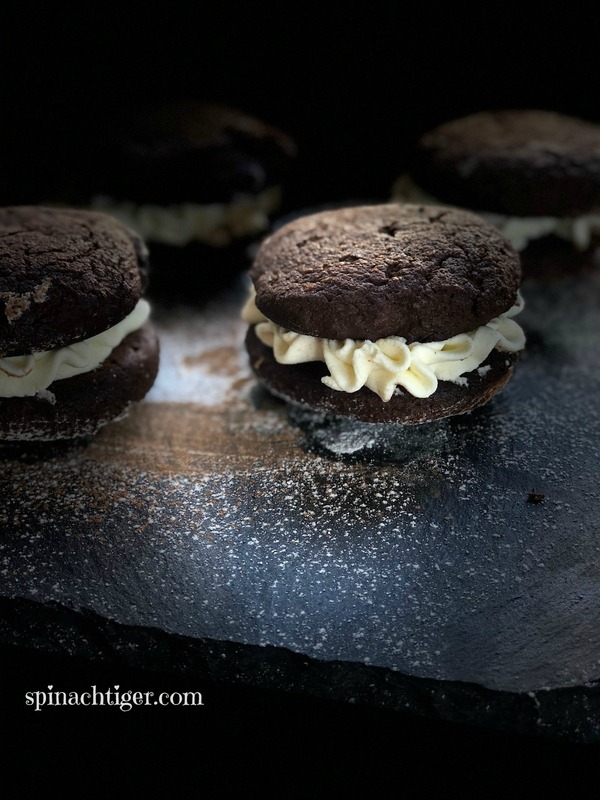 I recently posted a picture of these grain free chocolate whoopie pies on instagram and they were a big hit, with lots of requests for the recipe. Every since I got my whoopie pie pan I’m having fun, like these keto pancakes. I also told everyone there that my word for the year is diligence, and let me tell you that is what it took to get this perfect, springy sponge cake texture a whoopie pie requires. Like all of my successful alternate flour recipes, I test again and again and again using Swerve as our sweetener. This has paid off for me and for you, because google takes these to the top of the picks and shares them with you. You will see several versions of darker chocolate whoopie pies here as I kept improving the recipe. This is all about using various unsweetened cocoas. We liked all versions and all the fillings, but the recipe we decided upon struck a nice balance of chocolate and was the most moist. As far as fillings, we liked them all! Our decision at the end was to mix these, but you should make it your own way, and the recipe will note that. I want you to have baking success, especially if you’re using these recipes for a low-carb or ketogenic diet or life style. Aside from that, the ingredients are expensive and as a blogger, I can absorb the cost of dozens of eggs, butter, cream and Swerve so you don’t have to. Whoopie pies are actually little cakes that are filled with a cream or frosting center. Since I was baking with coconut flour, I was struggling getting a moist enough crumb that could be refrigerated without turning into a rock, in case you used the stabilized whipped cream filling! 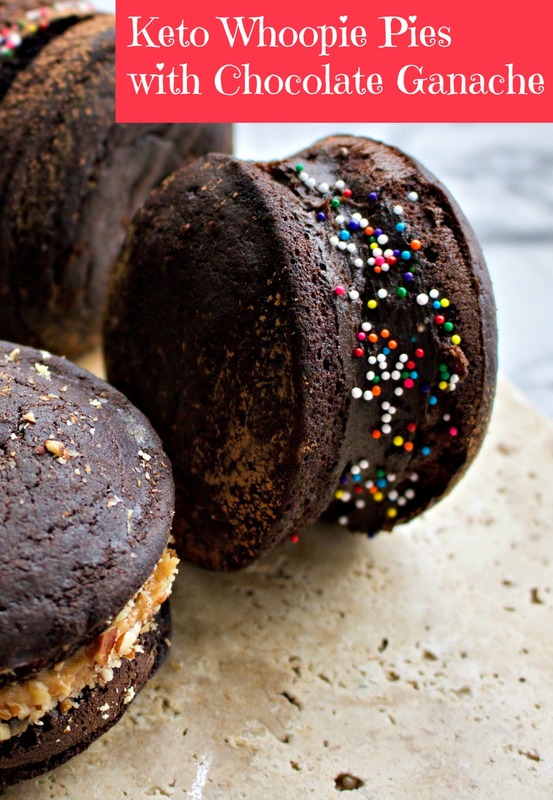 The challenge with making a grain free whoopie pie is getting that “bounce” a whoopie pie has. The cake can’t fall apart or be too crumbly. It has to hold the filling and eating should be easy. My first three grain free whoopie pies tasted good, but the texture was too dry. I tried making them with all butter (for flavor). Then I used half butter, half avocado oil which was okay. On the last batch I used 100% avocado oil and the texture went beyond my expectations. 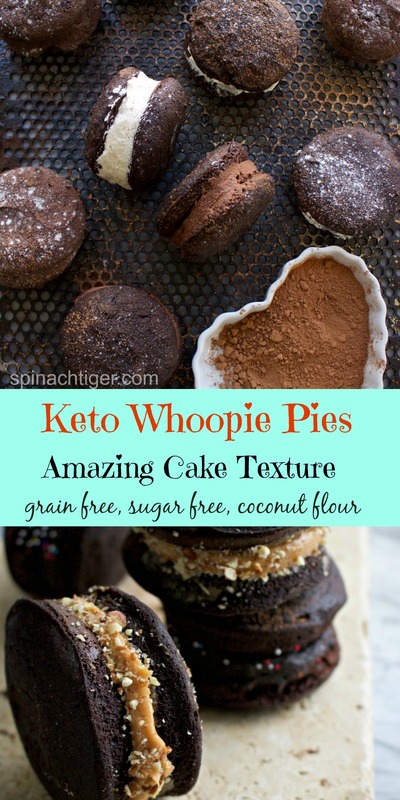 This made a world of difference and gave me the grain free whoopie pie I was looking and the closest cake texture to all purpose flour. This means this is a great recipe, because you cannot tell the difference! Coconut flour is not very expensive and you don’t need to use a lot. In general, you will use 1/4 cup compared to 1 cup of regular flour. Coconut flour has no real coconut taste once baked. Coconut flour absorbs liquid more than other flours. You will use more eggs than usual. This recipe uses six eggs. Coconut flour will yield a sponge cake texture and baked goods will stay moist, if baked with enough liquid. I use this coconut flour. 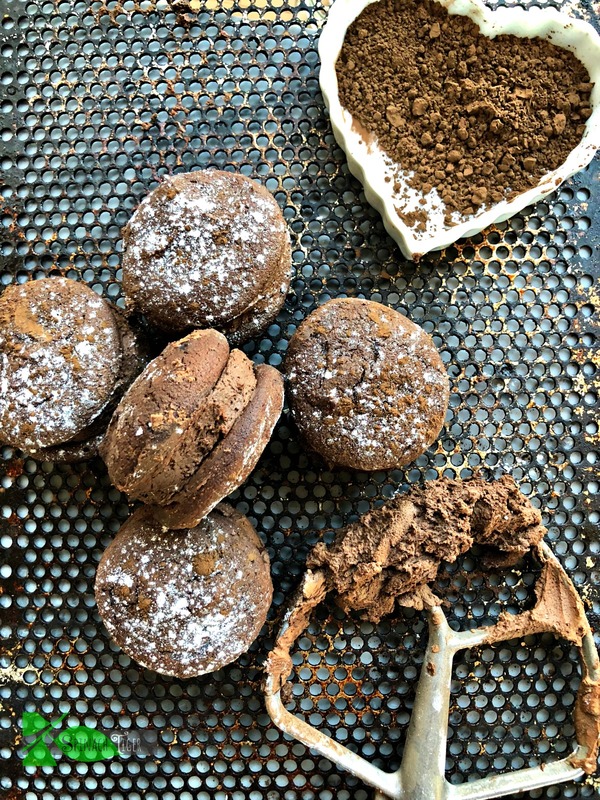 In this recipe for grain free chocolate whoopie pies, I used coconut flour, unsweetened cocoa both regular and dark, vanilla, six eggs and sour cream. I did not make the typical marshmallow cream filling because this is a keto recipe. I do offer you many ways to fill these below, and will keep adding fillings as I make them. I’m thinking raspberry cream would be fun! By the way, you can make cupcakes with this recipe too! Stabilized Whipped Cream: 1 cup heavy whipping cream with 2 tablespoons cream cheese, 2 tablespoons Swerve. Peanut Butter Cream : 1/4 cup butter, 1/2 cup peanut butter, 1 cup confectioner’s sugar, 1/4 cup heavy cream. Cream Cheese Frosting: 4 ounces cream cheese, 4 tablespoons unsalted butter, 2 cups Confectioner’s Swerve. Chocolate Ganache: If using Lily’s Dark Chocolate Melt 8 ounces Darkest Chocolate chips with 8 tablespoons butter. Once smooth, add 1 cup heated cream. Mix well. Cool Completely. (this is my favorite chocolate filling). Lily’s Dark Chocolate is used by many keto bakers, but it doesn’t melt and perform exactly the same. However, when I added in more butter than usual, I got a fantastic result. Chocolate Ganache, if using regular dark chocolate: Heat 1 cup heavy cream. Pour over 8 ounces chopped chocolate. Sit for five minutes. Stir until incorporated. Stir in 2 tablespoons softened butter. See recipe for values. 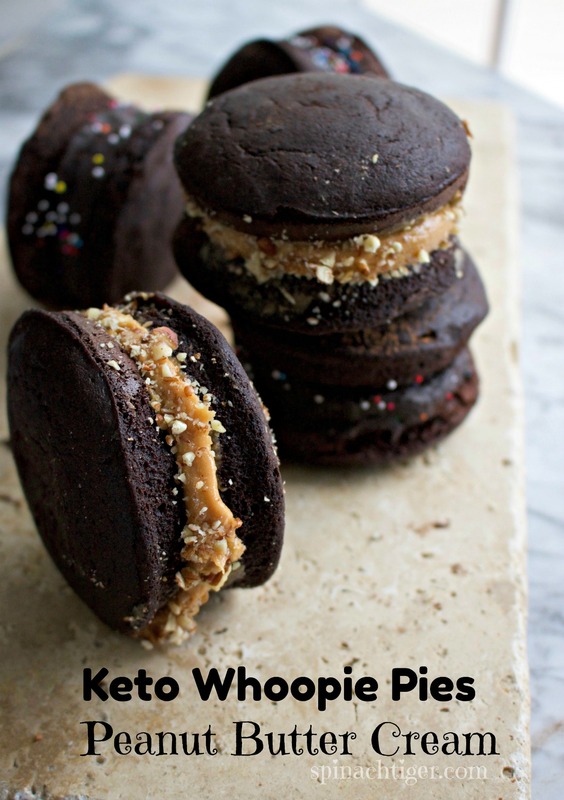 Each Whoopie pie is 4 net carbs, 309 calories, but does NOT include filling. Keep in mind that while these are low-carb and keto friendly, they are high in calories and should be eaten as special treat. 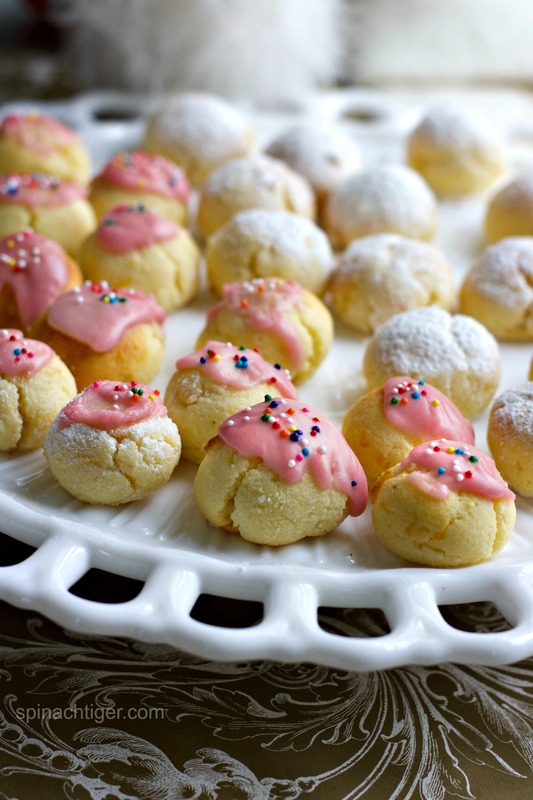 You might also love these keto ricotta cookies, or this grain free lemon cake. 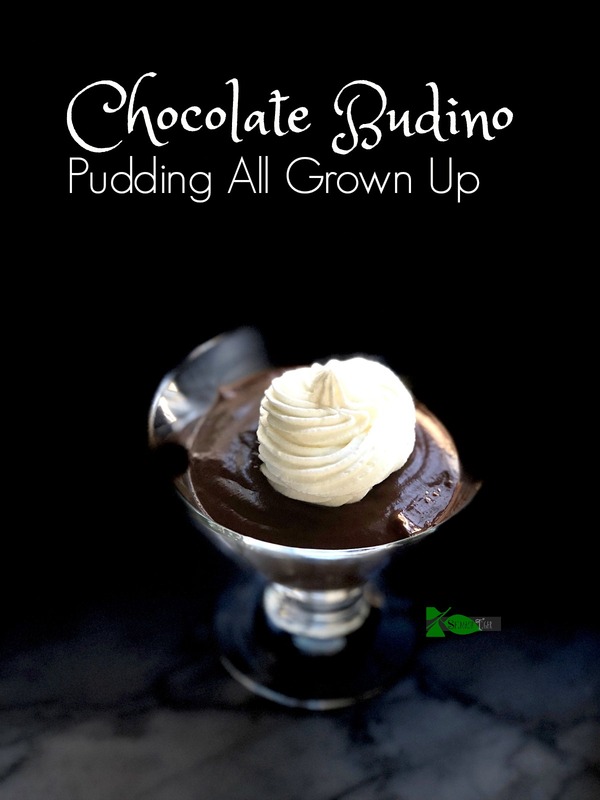 You may also like this keto friendly chocolate budino. 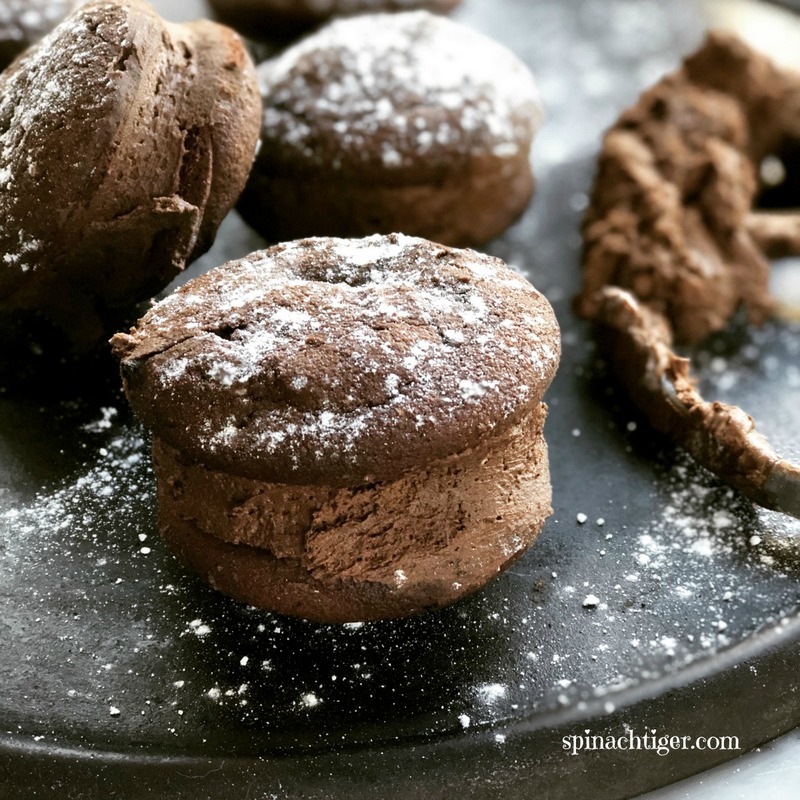 A low Carb version of the chocolate whoopie pie, using coconut flour with unsweetened cocoa as the base. 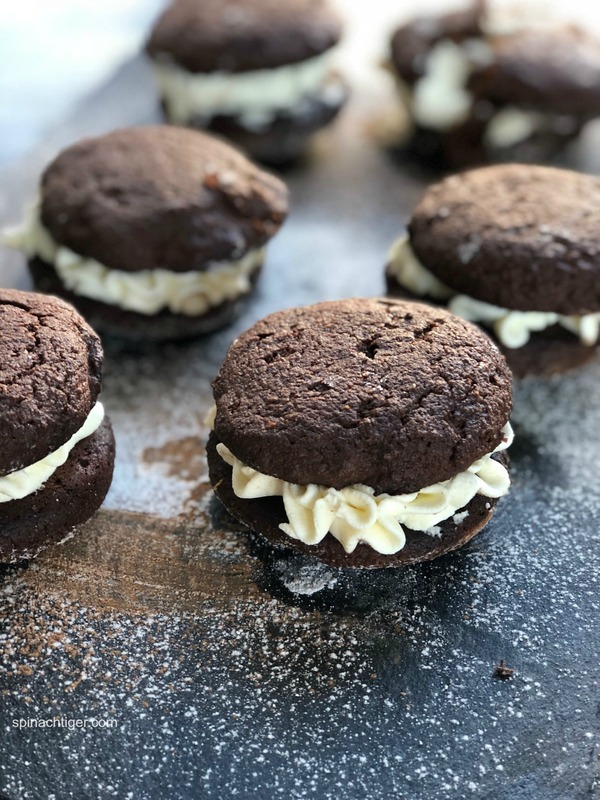 These grain free whoopie pies are filled with a stabilized whipped cream. Mix coconut flour with baking soda, salt. Set aside. Heat oil and unsweetened cocoa in sauce pan, just enough that the mixture is incorporated. Place this mixture in your mixer. Add eggs and sour cream. Incorporate well. Add coconut flour mixture. Mix batter until ingredients are well incorporated. Grease your whoopie pie pan. This is very important. Bake for 8 to 10 minutes at 350 Degrees F.
Fill with any filling of your choice. See body of this recipe for filling ideas. Re: Unsweetened cocoa. I used Hershey's regular but 2 tablespoons were the dark chocolate. You can use all regular. Nutrition: Does NOT include filling. Peanut Butter Cream : ¼ cup butter, ½ cup peanut butter, 1 cup confectioner's sugar, ¼ cup heavy cream. Chocolate Buttercream: ⅓ cup unsweetened cocoa, 1 cup confectioner's sugar, ½ cup butter, vanilla, ¼ cup heavy cream. Cream Cheese Frosting: 4 ounces cream cheese, 4 tablespoons unsalted butter, 2 cups Confectioner's Swerve. Chocolate Ganache: If using Lily's Dark Chocolate Melt 8 ounces Darkest Chocolate chips with 8 tablespoons butter. Once smooth, add 1 cup heated cream. Mix well. Cool Completely. (this is my favorite chocolate filling). Chocolate Ganache, if using regular dark 70% chocolate: Heat 1 cup heavy cream. Pour over 8 ounces chopped chocolate. Let sit for five minutes. Stir until incorporated. Stir in 2 tablespoons softened butter. Note: This page contains Amazon affiliate links, which earn Spinach Tiger a small commission, but do not raise your price. Hello and thank you for all your hard work and research on this recipe! QUESTION: Should I measure FIRST, and THEN SIFT? Or, sift a bunch, and THEN measure out, what has been sifted.? It’s probably a good idea to sift then measure. How many is this supposed to make? You don’t mention in recipe. It makes 12 sides, 6 whoopie pies.